We make all of our quail calls and feeders at our facility in Waynesboro, Georgia. ALSO, we're your complete source for habitat management consulting. Jim Evans, inventor of the original Covey Base Camp™, is also a leading quail expert and certified wildlife biologist. 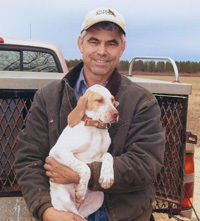 Through years of consulting work for private landowners, commercial operations, universities and conservation organizations, Jim has developed unprecedented knowledge in quail habitat, and writes habitat management articles for several conservation magazines.